The Anna's Hummingbird is a mid-sized hummingbird found in western North America. 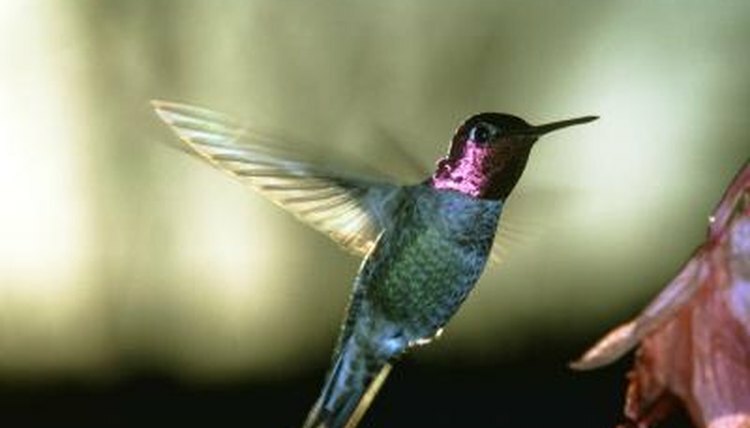 Like most hummingbirds, Anna's hummingbirds do not form bonded mating pairs and generally do not live in social groups. The Anna's hummingbird usually breeds between November and May. During this time they can hatch up to two sets of eggs. The Anna's hummingbird mating season lasts up to about six months, allowing the female to hatch two sets of eggs during that time. After breeding, the female Anna's is responsible for building the nest, sitting on the eggs and caring for the young after they hatch. According to the University of Michigan Museum of Zoology, the female uses spider's webs, leaves, feathers and hair to build her nest, after which she seeks out a male with which to breed. The male follows the female back to her nest where he performs a mating ritual of high dives followed by sharp plummets, which are meant to impress the female. The Anna's hummingbird typically lays 2 eggs each time she broods. The tiny white eggs are about 0.5 inches long and 0.4 inches wide. The incubation period typically is 16 days, but can range from 14 to 19 days in length. The baby hummingbirds are born with almost no downy feathers and their eyes are closed. The young birds are incapable of caring for themselves and all care is provided by the mother. Baby Anna's hummingbirds remain in the nest for only 18 to 23 days. At day five their eyes have opened and by the sixth day they are feathered in down. Upon reaching early maturity the young leave the nest. Upon leaving the nest the two young birds show their only signs of social behavior, often remaining together until the fall season, when they separate. The male and female Anna's hummingbirds reach sexual maturity at about one year of age. The average life span of the Anna's hummingbird is eight years. Hummingbirds are the only birds able to fly forwards and backwards. They also have the ability to hover in one spot, beating their wings about 80 times each second. Because they use so much energy during flight, hummingbirds can eat up to half of their own weight in food everyday. They consume flower nectar, insects, spiders and sap.